This text takes an empirical approach to the subject, based on applying statistical and other machine-learning algorithms to large corporations. 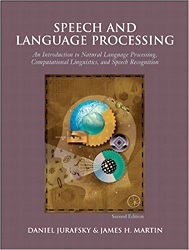 The authors cover areas that traditionally are taught in different courses, to describe a unified vision of speech and language processing. Emphasis is on practical applications and scientific evaluation. An explosion of Web-based language techniques, merging of distinct fields, availability of phone-based dialogue systems, and much more make this an exciting time in speech and language processing. The first of its kind to thoroughly cover language technology – at all levels and with all modern technologies – this text takes an empirical approach to the subject, based on applying statistical and other machine-learning algorithms to large corporations. The authors cover areas that traditionally are taught in different courses, to describe a unified vision of speech and language processing. Emphasis is on practical applications and scientific evaluation. An accompanying Website contains teaching materials for instructors, with pointers to language processing resources on the Web. The Second Edition offers a significant amount of new and extended material. Dan Jurafsky is an associate professor in the Department of Linguistics, and by courtesy in Department of Computer Science, at Stanford University. Previously, he was on the faculty of the University of Colorado, Boulder, in the Linguistics and Computer Science departments and the Institute of Cognitive Science. James H. Martin is a professor in the Department of Computer Science and in the Department of Linguistics, and a fellow in the Institute of Cognitive Science at the University of Colorado at Boulder.